JULIA SUKOSD (nee Gyorgy) age 52. 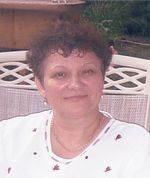 Beloved wife of Csaba; dear mother of Csaba and Melinda; sister of Peter, Janos, Sandor, Geza, Ibi David and Csaba; daughter of the late Janos and Julianna Gyorgy. FUNERAL SERVICE 7 PM THURSDAY AT BODNAR-MAHONEY FUNERAL HOME & CREMATION SERVICE 3929 LORAIN AVE. CLEVELAND (216)631-3075 where the family will RECEIVE FRIENDS 4-7 PM. Contributions may be made to West Side Hungarian Lutheran Church 3245 W. 98th St. Cleveland, 44102. It was a pleasure working with Julia in medical records. I am sorry for your loss.